The ear is the organ of both hearing and equilibrium. Hearing is the transduction of sound waves into a neural signal that relies on the structures of the ear. The ear is subdivided into 3 major parts: the external ear, middle ear, and internal ear. The outwardly visible structure that is often referred to as the ear is more correctly referred to as the outer ear (external ear), or the auricle. The C-shaped curves of the auricle direct sound waves towards the ear canal, which enters into the skull through the external auditory meatus of the temporal bone. At the end of the auditory canal (sometimes caused external acoustic meatus) is the tympanic membrane, or ear drum, which vibrates with the movement of air in sound waves. Figure 8.39. Anatomy of the Ear. The outer ear is the auricle and ear canal through to the tympanic membrane. The middle ear contains the ossicles and is connected to the pharynx by the auditory tube. The inner ear is the cochlea and vestibule which are responsible for hearing and equilibrium, respectively. This work by Cenveo is licensed under a Creative Commons Attribution 3.0 United States (http://creativecommons.org/licenses/by/3.0/us/). Along the length of the auditory canal are ceruminous glands that contribute to the production of cerumen (earwax). Because cerumen is sticky it can help prevent small particles from finding their way to the tympanic membrane. Cerumen also helps prevent bacterial growth, waterproofs the auditory canal and tympanic membrane, and may be a deterrent to small insects. The middle ear consists of a space spanned by three small bones, the ossicles, which amplify the movements of the tympanic membrane. These small bones are the malleus, incus, and stapes, which are Latin names that roughly translate to hammer, anvil, and stirrup (Fig. 8.39). 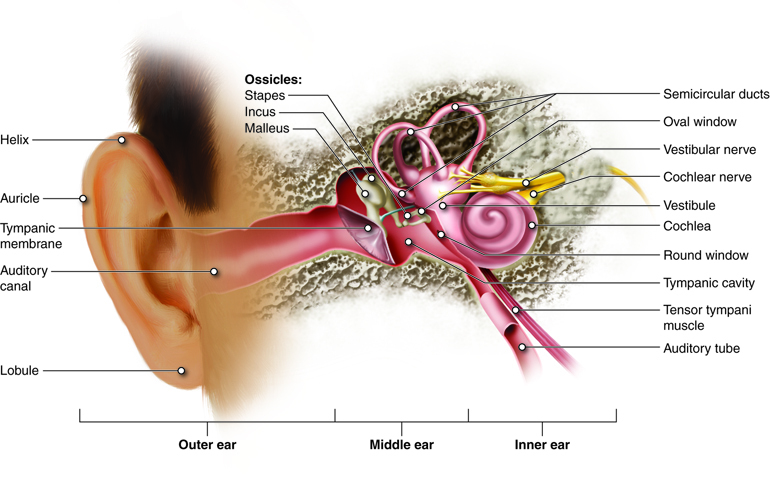 The malleus is attached to the tympanic membrane and articulates with the incus, which articulates with the stapes. The stapes is then attached to the inner ear at the oval window where the sound waves will be transferred to the inner ear. The middle ear is also connected to the pharynx through the auditory tube (Eustachian tube) that helps equilize air pressure across the tympanic membrane. When flying, you may have experienced what happens when the pressures across the tympanic membrane are not equal. As the plane climbs, pressure on the outside of the membrane decreases. If there is not a corresponding decrease in pressure in the middle ear, the pressure difference will cause the eardrum to push outward, causing pain and muffled hearing. The auditory tube is normally closed, but will typically open when muscles of the pharynx contract during swallowing or yawning. For this reason, chewing gum or drinking as the plane climbs will often relieve these symptoms. The auditory tube also provides a pathway of drainage for fluids that accumulate during middle ear infections (otitis media). Unfortunately, it is also the auditory tubes that play a role in causing otitis media, as microorganisms can use this path to move from the pharynx into the middle ear. This is especially common in children. The inner ear is entirely enclosed within the temporal bone. It has three separate regions: the cochlea, which is responsible for hearing and the vestibule and semicircular canals, which are responsible for balance and equilibrium. The neural signals from the regions of the inner ear are relayed to the brainstem through separate fiber bundles, but which run together as the vestibulocochlear nerve, cranial nerve VIII. The connection between the middle ear and inner ear is at the oval window, a membranous area at the entrance of the snail-shaped cochlea. The vibrations transmitted through the ossicles pass into the cochlea by way of the oval window. The cochlea is composed of 3 chambers separated from one other by membranes. 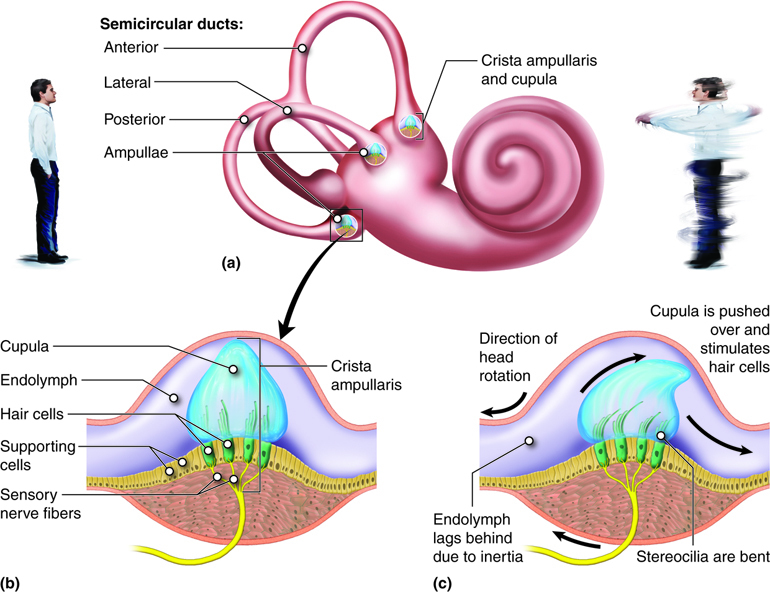 The scala vestibuli (upper chamber) and the scala tympani (lower chamber) extend the length of the cochlea and are continuous with a connection at the helicotrema (Fig. 8.40). The cochlear duct is the third, middle chamber positioned between the scala vestibuli and scala tympani. As the oval window is pushed in by sound waves vibrating from the ossicles, fluid within this tube is pushed along its length and the round window at its other end bulges out as a result of that movement. Figure 8.40. (a) Simplified Anatomy of the Cochlea. The cochlea can be modeled as a long tube running from the oval window, out to the helicotrema, and back. (b). Sound Wave Transmitted into the Cochlea. As sound is transmitted from air to the cochlea through the oval window, it creates a wave within the fluid of the cochlea (often called a standing wave). This wave creates displacement in the membranes of the cochlear duct, where sound is sensed. This work by Cenveo is licensed under a Creative Commons Attribution 3.0 United States (http://creativecommons.org/licenses/by/3.0/us/). 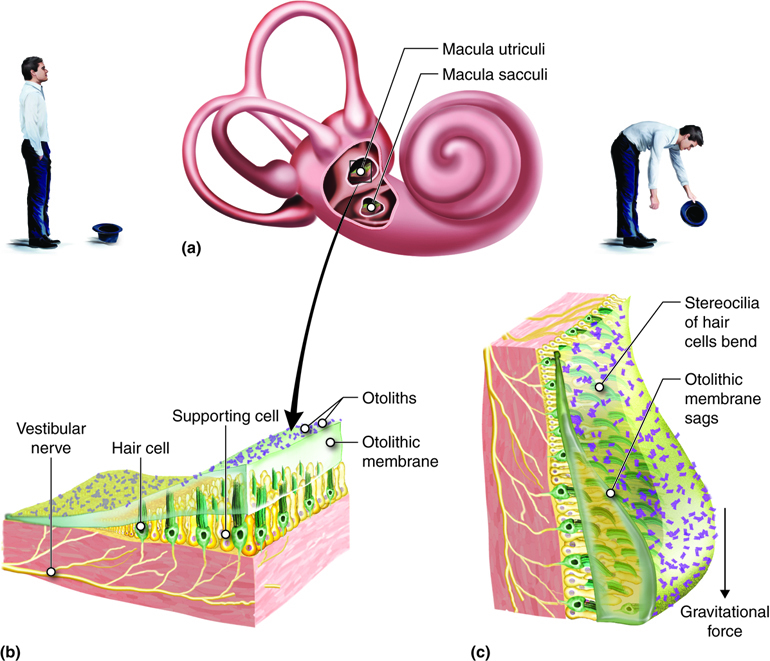 The organ for hearing, which contains the sensory receptors is known as the spiral organ of Corti and is located throughout the cochlear duct. The organ of Corti is composed of a lower basilar membrane against the scala tympani and an upper tectorial membrane within the cochlear duct (Fig. 8.41). 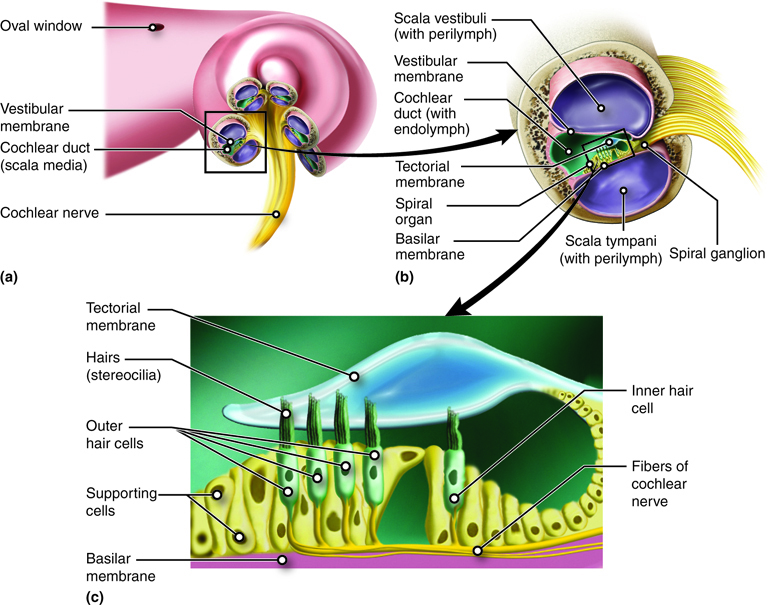 The receptors for hearing are hair cells with stereocilia that are sandwiched between the basilar membrane below and tectorial membrane above. The vibration of the stapes is transferred into the cochlea by way of the oval window, and fluids within the scala vestibuli and scala tympani begin to move. 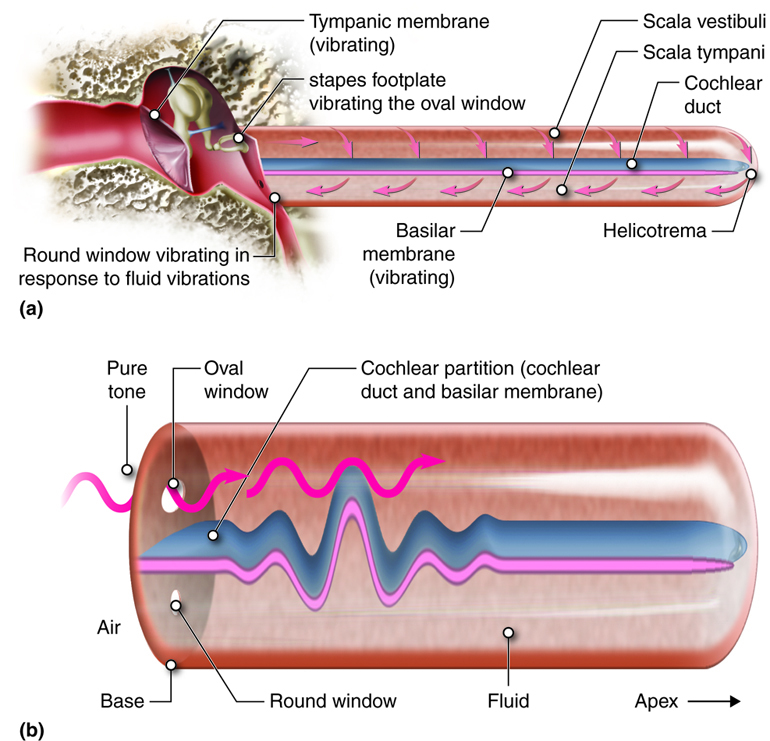 The movement of these fluids causes vibrations in the basilar membrane. As the basilar membrane begins to vibrate, the hair cells come in contact with the tectorial membrane positioned above (image a boat rising and falling with the waves – as the basilar membrane rises, the hair cells hit the tectorial membrane). The movement of the stereocilia on the hair cells, stimulates the formation of a nerve impulse. The impulse created by the spiral organ of Corti is transmitted into the brain via the vestibulocochlear nerve (cranial nerve VIII). Figure 8.41. Anatomy of the Cochlea. The cochlea is a spiral structure (a) divided into three chambers (b). The middle chamber, the cochlear duct, contains the spiral organ that has hair cells (c) for sensing the vibrations we perceive as sound. This work by Cenveo is licensed under a Creative Commons Attribution 3.0 United States (http://creativecommons.org/licenses/by/3.0/us/). Along with hearing, the inner ear is responsible for encoding information about equilibrium (the sense of balance), which it does in the vestibule and semicircular canals, structures that are sometimes collectively referred to as the vestibular apparatus (Fig. 8.42). Several types of sensory receptors provide information to the brain for the maintenance of equilibrium. The eyes and proproceptors in joints, tendons, and muscles are important in informing the brain about equilibrium. However unique receptors within the inner ear play a crucial role in monitoring equilibrium. There are two types of equilibrium: static (gravitational) equilibrium, which involves the movement of the head with respect to gravity and dynamic (rotational) equilibrium, which involves acceleration of the head in rotation, horizontal, and vertical movements. Similar to the cochlea, the both the vestibule and semicircular canals use hair cells with stereocilia to detect movement of fluid, in this case, in response to changes in head position or acceleration. Figure 8.42. Structures of the Vestibular Apparatus. This work by Cenveo is licensed under a Creative Commons Attribution 3.0 United States (http://creativecommons.org/licenses/by/3.0/us/). The information for static equilibrium and linear acceleration (dynamic) comes from the utricle and saccule within the vestibule. The saccule and utricle each contain a sense organ, called the macula, where stereocilia and their supporting cells are found. These maculae (plural) are oriented 90 degrees to one another so that they respond to positions in different planes (Fig. 8.43). Figure 8.43. Structure of the Maculae. The macula utriculi (macula of the utricle) lies horizontally while the macula sacculi lies vertically (a). If the head is tilted, the dense otolithic membrane will cause the stereocilia of the hair cells to move from the straight position (b) to the bent position (c), sending signals to the central nervous system that the head has been tilted forward. This work by Cenveo is licensed under a Creative Commons Attribution 3.0 United States (http://creativecommons.org/licenses/by/3.0/us/). The organs can respond to changes in position and acceleration because the tips of their stereocilia project into a dense otolithic membrane made up of a mixture containing granules of calcium and protein, called otoliths, (translated in medical terminology – ear stones). When the head moves, gravity causes the stones to move. The movement of the stones within the membrane causes the stereocilia to bend, initiating action potentials in the vestibular nerve fibers that innervate them. Bundles of stereocilia are arranged in various directions, so that any direction of inclination will depolarize a subset of the hair cells. How the body senses head position and the linear (horizontal or vertical) direction of acceleration is determined by the specific pattern of hair-cell activity across the maculae. The semicircular canals are three ring-like extensions from the vestibule and are mostly responsible for dynamic equilibrium. One ring is oriented in the horizontal plane and two others are in the vertical plane. At the base of each semicircular canal, where it meets with the vestibule is an enlarged region known as the ampulla, which contains a hair-cell containing structure, called the crista ampullaris that responds to rotational movement. The stereocilia of the hair cells extend into the cupula, a membrane that attaches to the top of the ampulla (Fig. 8.44). Figure 8.44. Structure and Function of the Semicircular Canals. The three canals each have an ampulla containing a crista ampullaris and cupula (a). When the head is stationary, the cupula, and embedded stereocilia, are not bent (b). When the head rotates in the same plane as one of the canals, the fluid in the canal (endolymph) lags, leading to bending of the stereocilia in the cupula, which initiates nerve impulses. This work by Cenveo is licensed under a Creative Commons Attribution 3.0 United States (http://creativecommons.org/licenses/by/3.0/us/). When the head rotates in a plane parallel to the semicircular canal, the fluid in the canal does not move as quickly as the head is moving. This pushes the cupula in the opposite direction, deflecting the stereocilia and creating a nerve impulse. Considering the semicircular canals on either side of the head, three orthogonal planes are defined, the horizontal plane with both horizontal canals, and two vertical planes 90o to each other with the anterior canal from one side and the posterior canal from the other. In each pair, deflection of the cupula on one side of the body causes depolarization of the hair cells while the same movement causes hyperpolarization of the hair cells on the other side of the body. For example, when the head rotates to the right, the horizontal canals are active and the right side depolarizes while the left hyperpolarizes, indicating the direction of the movement. By comparing the relative movements of all six semicircular canals, the vestibular system can establish movement in any direction within three-dimensional space.